We believe the most reliable solution for temperature control is a discrete Eurotherm temperature controller combined with a separate DC power supply. 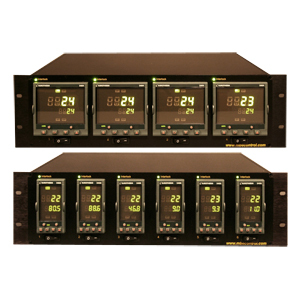 Our rack mount Eurotherm module provides an easy path to upgrading your temperature control loops to this configuration. Rear panel connectors are compatible with Veeco electronics racks. We can assist with cables for other systems or for new installations. The interlock indicator lights are available in 2 configurations. The standard is a green light that is illuminated when the interlock is made. Alternatively, the interlock indicator comes in red in which case it is illuminated when the interlock is not made. The interlock function can be turned off in software.